The Diablo III news, that is a no-news, with a vibe of teasing and disappointment. Kind of a cornucopia of mixed feelings. Bashiok posted in twitter a photo of what they call the Monster Wall. 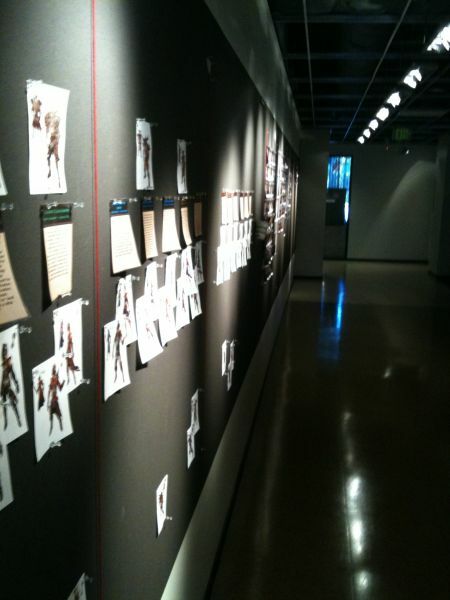 This office wall has several Diablo III monster concept art printouts pinned to several billboards. Up to that point that’s exciting. The disappointment comes in several flavors: the photo is taken in such an angle that it doesn’t show what’s to the nearby and farthest point of the wall, the size of the image is large but the resolution is intentionally really low to the point you can’t even read the text closest to the camera’s lens, and third … actually, we don’t need a third to be disappointed. That darn Bashiok the Fallen is a shenanigan teaser. All misdirection aside with that blurred and low-res image … Did anyone notice the color-coded text in each paper across the wall? Green, Blue, Orange, Red? Second, if there’s any sense observed in this photo, the images at the top are the monsters. The paper beneath shows the item color code and probably some lore or description. Beneath the paper is several concept art of what look like the appearance of your character wearing said item looted from the monster? Hmm. Maybe there was more in this image than originally thought. Aha! Now look at the 10 images below the blue text paper. There’s a pattern in the position they are laid: Male and Female. The shocker? Are we seeing here the five classes? Gasp! The Diablo fansite people (including Flux) toured this area before last year’s Blizzcon, but were barred from taking any pictures or reporting on it, since there were numerous new monsters shown on it. Perhaps we’ll get a better look this year? We might need someone to help us pin Bashiok the Fallen while we infiltrate this secure area. Just went out to the twitter world but thought you might want a single thread here to discuss it.